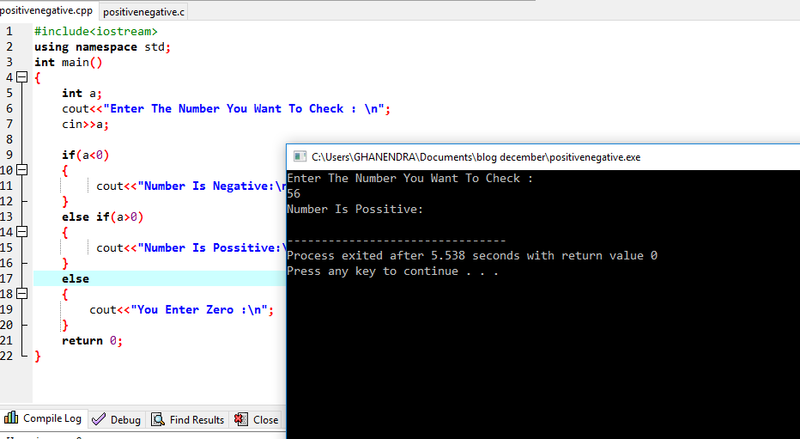 Problem:- Write A C++ Program To Check Number Is Positive Or Negative. The number should be Entered Through User Then program Print the Output. Logic:- As we know that if a number is greater than 0 ( Zero ) Than number is positive and if a number is Less than 0 ( Zero ) than a number is Negative and else number is equal to zero then an entered number is Zero or equal to zero. Below is an explanation of the problem with an example. For this type of problem, there maybe maximum 3 cases, all cases are given below. Case 1:- Either number is greater than zero (Number is Positive). Case 2:- Either number is less than zero (Number is Negative). Case 3:- or number is equal to zero (Number is Equal to Zero). Case 1:- If a number is greater than zero the number is positive let's take an example assume the number is 20 then compare number 20 to zero definitely number is greater than zero so the program will print "Entered number is the Positive number". int a; // 'a' is a number entered by user. Case 2:- If a number is less than zero the number is negative let's take an example assume the number is -20 then compare number -20 to zero definitely number is less than zero so the program will print "Entered number is the Negative number". Case 3:- If a number is equal to zero the number is Zero let's take an example assume the number is 0 (Zero) then compare number 0 (Zero) to Zero definitely number is equal to zero so the program will print "Entered number is Zero". 1. C++ Program To Find Number Is Even Or Odd Using Pointer. 2. C++ Program To Find ASCII Value Of Any Character Or String. 3. C++Program To Find Greatest Of Three Number. 4. C++ Program To Calculate Factorial Of A Given Number. 5. C++ Program To Find Compound Interest. 6. C++Program To Swap A Number Without Using Third Variable. 7. C++ Program To Find Number Is Prime Or Not. 8. C++ Program To Check Upper Case Lower Case Digit And Special Symbol. 9. C Program To Find A Percentage Of Marks.